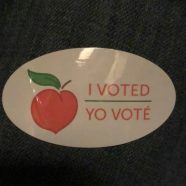 As controversy continues about Georgia’s outdated, unverifiable voting equipment and its results, the safer option for Georgia voters continues to be voting from the convenience of home to reduce the risk of vote manipulation. Apply for an Absentee Ballot, vote at home and deliver the ballot to the county office in person no later than 7 p.m. on Election Day. This creates a verifiable, paper audit trail that can be recounted and it reduces the time frame for tampering if it is delivered on Election Day. Apply for an Absentee Ballot, vote at home and mail the ballot to the county office at least 2 business days before the election. This creates a verifiable paper audit trail that can be recounted. The later it is mailed the less chance of tampering, but you should allow at least 2 business days. Vote on Election Day at the polls. Poll votes cannot be verified to have been counted correctly for the candidate you chose, accurate recounts cannot be conducted because there is no audit trail, and poll locations may have been moved due to summer school renovations. Use Early Voting at selected polling locations. Votes cast cannot be verified, audited or recounted and all memory cards are vulnerable to tampering throughout the early voting period. Once you receive a ballot from the county and vote, you can mail or deliver it to a county office or annex. You cannot turn other people’s absentee ballots unless they checked the disabled box on their application. You cannot turn an absentee ballot into your precinct on Election Day but if you forget to mail or deliver it, you can bring it with you, have them spoil it, and vote electronically there.